If you've never made a purse before, this just might be the purse for you. My last bag, the envelope clutch, was a great opportunity to explain the basics of leather working and bag construction. But that project had six major seams and nine minor ones. This bag, on the other hand, has two: the bottom and sides are sewn in one long seam, and the zipper is attached to the top in another. And that's it! If you can sew two seams — and no, you do not need a sewing machine — you can sew this bag. It's a simple but versatile design, and if you haven't worked with leather, this would be a great project with which to learn. Click any photo to enlarge. You'll need everything you see here. Clockwise from top: 1) A zipper. (Mine was 11".) 2) A rotary cutter, cutting mat, and ruler. 3) Four long, straight needles, such as those used in bookbinding. 4) Linen thread, such as that used in bookbinding. 5) An awl. 6) A pen. 7) A lump of beeswax. You will also need a hammer and, if you don't have access to a workbench, an old wooden cutting board (not pictured). Of course, you will also need some leather. As I wrote last time I shared a leather tutorial, there are some things it helps to know if you haven't worked in leather before, or aren't super familiar with it. If you live in a city where you can obtain leather at a fabric or specialty store, you're in luck. And if your local fabric store carries leather, keep in mind that it's cheaper to buy remnants than entire hides — and more manageable, given how big hides can be. I pieced this project together from a remnant of black suede and a remnant of fabric-backed pink cowhide. (Your leather doesn't have to be fabric-backed, in fact, it's probably preferable if it's not — but remnant-buyers can't be choosers.) My total cost: about $30. But if your usual brick-and-mortar fabric source doesn't sell leather, you can find it online at a number of retailers — call and ask questions, to check you're getting what you think you're getting. And there is plenty of leather on eBay. The obvious drawback with buying leather (or any fabric) sight unseen is that you can't touch it until it arrives, but I've had wonderful results from eBay leather finds. You may also find you can buy leather garments fairly cheaply at thrift stores. The leather in, say, a pair of pants or a skirt won't be thick enough to make a bag, but the leather from, say, a jacket very well might. If you've never worked with leather before, you should know that it's sold priced per square foot, and, like denim, its heavy-dutiness is measured in weight per square foot — the higher the number of ounces, the thicker the hide. Many leather retailers will only sell whole hides, but you can find partial hides readily on eBay or in the remnants bins. For this bag, you'll only need about 4 square feet (3ish square feet of your outer leather, and about 1 square foot of your interior leather). And you'll want to use at least 8oz. leather for firmness (the interior leather can be more like 4-6oz). Leather needn't be expensive, but it's worth paying for quality: ideally, you want full-grain leather (that is, leather that hasn't been cut laterally, or "split," in order to double or triple the area of the hide), not a resurfaced ("corrected-grain") split. Leather is skin; it has a kind of integrity. Compared with corrected-grain splits or top-grain leather (which is the uppermost part of a split hide), full-grain leather is stronger, develops a nicer patina, and performs better over time. First, cut out your pattern pieces. 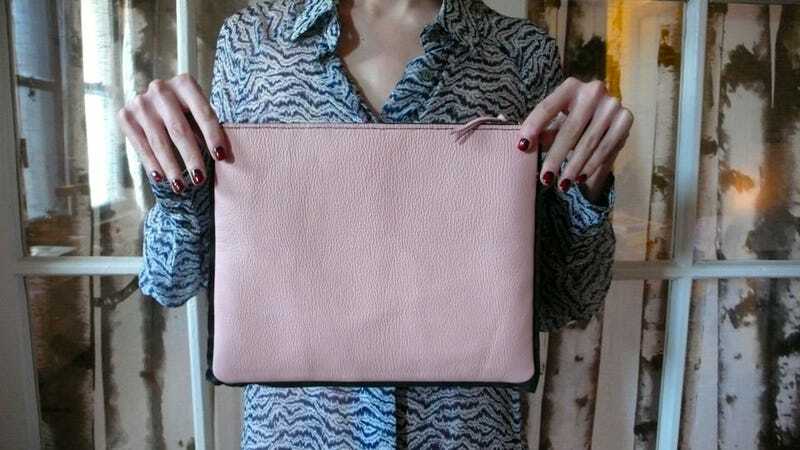 This simple, zippered clutch is made of two pieces of cowhide that sandwich a piece of contrasting suede. From the outside, the suede protrudes from the bag's sides and bottom like decorative piping. Inside, the suede serves to divide the bag into two pockets, so you can put your keys in one and anything that might be scratched by them in the other. I chose suede because it's nice to reach into a bag and feel suede against the back of your hand, and because suede, unlike leather, has no wrong side. I made this clutch large enough to fit a copy of the New Yorker, in addition to a phone, keys, pens, wallet, scarf, and all that other detritus. To sew leather by hand, you follow a simple process: first you mark your seams, then you punch your seams, and then you sew your seams. To start things off, using your awl and ruler, mark holes across the bottom of the front piece. Mark your seam 1/4" in from the edge, and prick the leather every 1/8" of an inch. At the left and right sides, stop making pricks 3/4" from the edge. On the sides of the front piece, make pricks 1/4" in from the edges. Mark a prick every 1/8" from the top down; stop when you are 3/4" from the bottom edge. Repeat with the back piece and with the divider piece. This bag has rounded corners. At the bottom corners of the front, back, and divider, mark pricks every 1/8" on a curve. Use a circular object for a guide; something with a 1" diameter is ideal. As you can see, I used a coaster. Line up your object with the "straight" lines of pricks you just set, so that the curve flows seamlessly from those pricks. Next, working on a workbench or an old cutting board, use the hammer to push the awl through every one of your pricks. You don't have to hit hard — a solid tap will punch the leather and turn your pricked marks into something you can pass a needle through with no trouble. I always say this, but please be careful whenever using an awl. Awls are very sharp. Wear closed-toe shoes to protect your feet if you drop the awl. Eye protection is also a good idea; the story of Louis Braille is never far from my mind when I'm using my awl. Once all your marked pricks are punched, arrange the layers of your bag sandwich as shown: bag front and back back, right sides together, and suede divider between them. The bottoms of the three pieces will be together, with their awl holes in alignment, but the pieces will be "facing" opposite directions. I.E. if the tops of the front and back are to the right, then the top of the divider will be to the left. Cut a piece of linen thread approximately three times as long as the bottom and one side of your bag. If your thread is white and your leather is not, pass it under an appropriately colored felt-tipped pen a couple times to dye it. Then run the thread through the beeswax 2-3 times, and slide it under the sole plate of a hot iron to set the wax. Now your thread is ready to sew. By the way, if you have trouble finding pure linen thread at your local craft store, try looking online, or in the bookbinding aisle. Awls, linen thread, and long, straight needles are all used in bookbinding as well as leatherwork. Now, to begin your first seam, take two long, straight needles and lock the thread ends. (Locking the thread is described here.) Push one needle through the first hole of the "straight" line of awl holes on the bottom of the bag. Go through that hole on the bag front, then the corresponding hole on the divider, and then the corresponding hole on the bag back. Pull through roughly half the length of the thread. Take the second needle, and push it carefully through the next set of awl holes: go from the bag front, through the divider, and through the bag back. Pull the thread until taut. Then return to needle one, and push it through the same set of awl holes that needle two just exited — only needle one, obviously, will be going from bag back, through divider, through bag front. Tug the thread to keep it taut. You just sewed your first stitch. Continue in this manner, stitch by stitch, weaving both needles from front to back and back to front, until you reach the last hole on the "straight" part of the bottom. Some things to keep in mind as you sew: when you pass the second needle through the stitch the first needle has just exited, try not to sew through that first thread, which will weaken it, and, eventually, your seam. You want the two threads to pass by each other in the tunnel of the awl holes. Also, tug on the threads after each stitch to keep your tension even. You don't want your stitches too tight — leather has some natural stretch, and depending on the tanning process it can be very stretchy indeed, so your seam needs some flexibility — but they can't be too loose, either. When you get to the last stitch on the "straight," use scissors to trim the edges of the bag front and back, to leave a 1/4" curved seam allowance as shown. Turn over the part of the seam you just sewed as shown. Do you see how the bag is coming together? Now, pound flat the bottom of the bag along the line of your stitching. Pounding a seam with the hammer like this takes a lot more pressure than punching awl holes: you'll need to hit the crap out of it, basically. Work on your workbench or cutting board. With a rubber band, wrap the head of the hammer in a piece of scrap suede or thin leather to protect your bag-to-be. Hit the seam until it flattens completely. Now, using your needles, begin to sew around the corner. This is tricky — the leather will be resistant to turning this corner — so go stitch by stitch. The pressure from the leather will be acting on your thread, so make sure to keep an eye on your tension. Keep it as taut as you can. When you've gone around the curved part, turn out your work and clip the seam allowance as shown. Measure, prepare, and lock a thread approximately three times as long as one side of the bag. Starting from the same set of awl holes that you initially departed from, push one needle through all three layers, and start to turn the other corner, as above. When you've turned both corners (pictured), continue sewing up the side seams. Sew a little on one side, then sew a little on the other, until you get to the top. Stitch up to the top of both sides and then backstitch another 3-4 stitches. Pull both needles to the same side, knot your threads, and cut the needles free. Then clip the side seam allowances as shown. Using the hammer, pound the side seams. On each side of the interior divider, push out the rounded corners with a bone turner, if you have one, or a pen or a butter knife, if you don't. Pound the corners. Pound the bottom seam again, too, because why not? Pound the sides, corners, and bottom thoroughly, from front and back. I cannot stress enough how important pounding your seams is: it's the difference between a wrinkled shirt and a pressed one. Also, it's fun. Just hit that fucker! Hit it cheerfully but hard. When the pounding's done, your next step might be to dye the raw edge of the top of the bag, like I did, with a black Sharpie. I colored it to match the black suede and the black zipper. For your second and final seam, mark a set of awl holes all the way around the opening of the bag. Mark them at 1/8" intervals, 1/8" from the top of the bag. Punch the marked holes with a hammer as before. Take the zipper and start to press it against the opening with your fingers; if you want to dab a little glue on the zipper tape, you can. Glue stabilizes the zipper and holds it in place while you sew. Measure a piece of thread approximately three times longer than the whole distance around the bag opening; prepare the thread, wax it, and lock it. Then start sewing the zipper to the bag front. This seam is super easy and goes a lot faster than the first, because there are no tricky turns and there is only one layer of leather to worry about (the thickness of the zipper tape is negligible). When you get to the end of one side, repeat the glue trick if you want, and sew your way back up the other side. At the end, pull both of your threads inside the bag, knot, and cut the needles free. Add a zipper pull from a piece of scrap leather — if you wanted to be ambitious, and have enough left over, you could even make a wristlet — and you're done. Here's the finished bag. I might decide to clip the black suede at the corners; I had the idea the right angles of the protruding suede would contrast nicely with the rounded corners of the leather, but I'm not sure I like it so much in practice. The suede corners could be curved. What do you guys think? I might mull it over for a couple of days. I am pretty into the finished purse. And I can fold it in half to tuck it under my arm. I can't wait to take her out into the city.